It has been said that great style and design is all in the details. With this in mind, I am very happy to share two amazing fireplaces from the home of Sandra Cavallo. The Cavallo home, located in Cape Cod with gorgeous views of Old Silver Beach, is well known to her many followers of "Old Silver Shed" on Instagram. Today, you're in for a real treat as I share just a few of the details that elevate Cavallo's fireplaces from ordinary, to exceptional, so take notes! There's nothing like gathering in front of a fire on a cold winter night with family and friends or enjoying the cozy ambiance a fireplace adds to a room. This ambiance is all the more significant for the Cavallos. I'm going to tell you why! Most of the stones for the fireplace in the family room were collected by Sandra, her children and her husband from around their property as they were building the house. 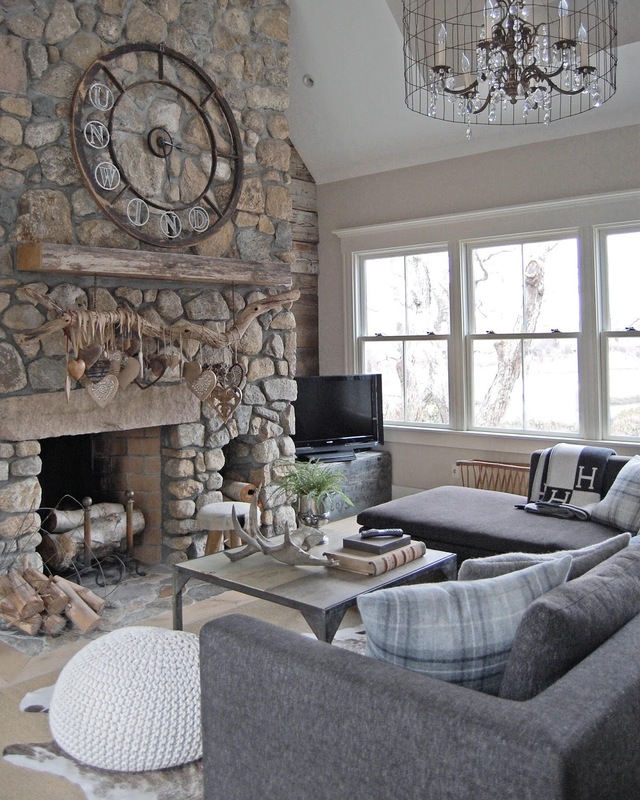 Isn't this family room beautiful? The large lintel stone slab you see was salvaged and repurposed from an old cottage that was on the property when Sandra and her husband purchased the property. Regarding the old cottage, Sandra shared, "We dismantled it and saved everything we could to reuse in the new house. The stone is local West Falmouth pink granite (the same that Jackie Kennedy used for John F. Kennedy's grave in Arlington). It was originally one of the steps in the cottage bulkhead." There are so many heartfelt details incorporated into the Cavallo's fireplaces. "The wood mantle is antique white oak, one of three pieces that we bought at our local sawmill, these were the only pieces leftover from the restoration of the U.S.S. Constitution in Boston." A little detail I personally find amazing! Just look at that clock!! Sandra made the "UNWIND clock hanging above the mantel using an old round window frame and vintage aluminum screen door initials found at Brimfield." Brimfield, Massachusetts is known for its famous flea market, antiques and collectibles. And, while I am not certain, I would be surprised if Sandra didn't have a hand in altering the gorgeous chandelier to incorporate a touch of her own personal vintage style! 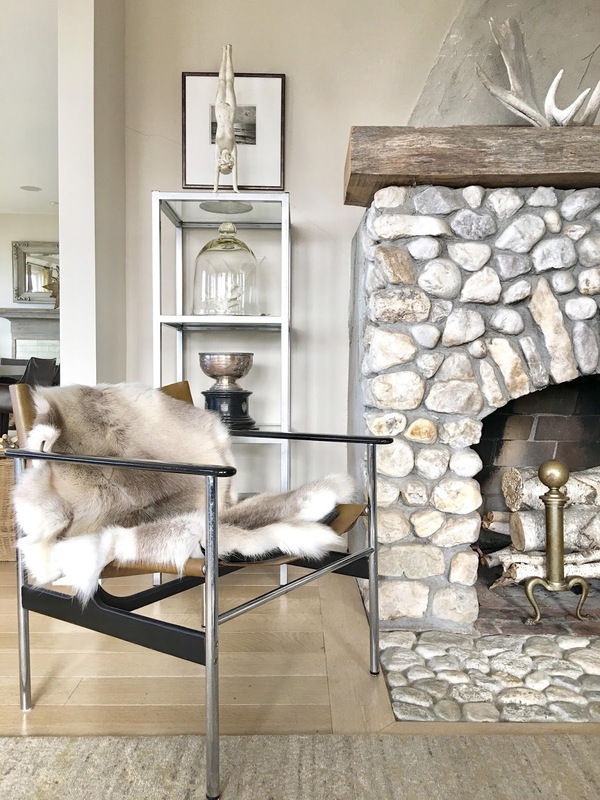 If you follow Sandra @oldsilvershed, you know her home is an eclectic balance of modern and vintage styles, resulting in an elegant and enduring design that is both comfortable and classic. She collects bits and pieces of history and intertwines layers of the historic salvaged pieces with sophisticated furniture and art, personal mementos and found objects. One such found object is the large branch hanging from the mantel. 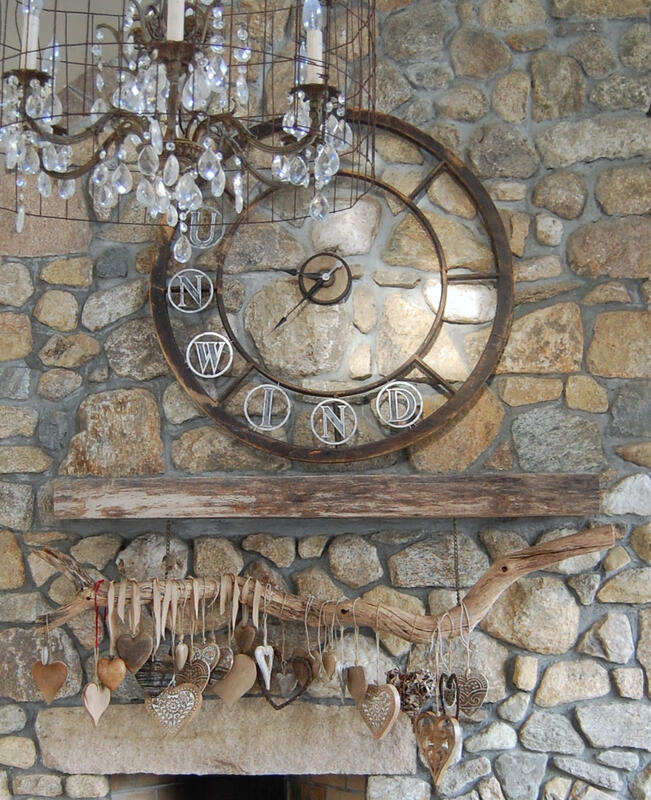 "The large branch hanging was blown down during Hurricane Irene, it used to be outside our kitchen window and I loved looking at it from there - I was upset when it was blown down so we dragged it inside and hung it from the mantel. 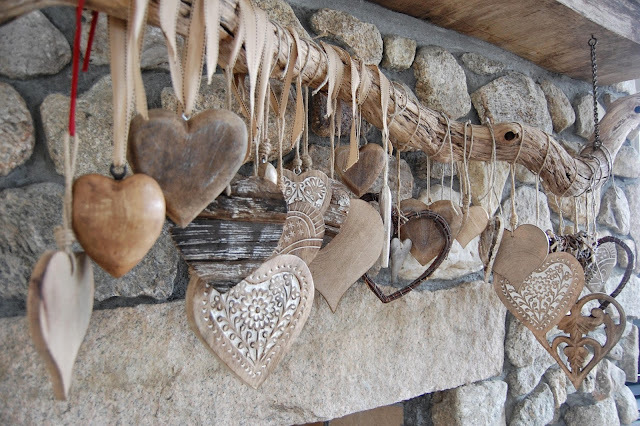 I hang my Christmas stockings from it each year, and my wooden heart collection (collected during our travels in Switzerland)." One tender little detail about these hearts is that you'll notice only one heart is held by a scarlet ribbon. This is in honor of Sandra's mother who "sang Scarlet Ribbons" to her when she was little! 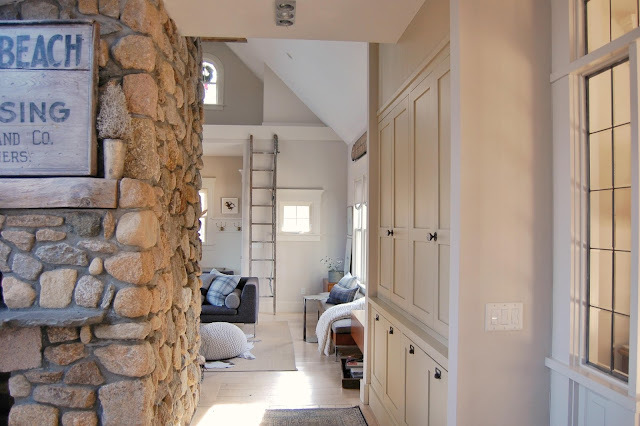 The large family room stone fireplace is exposed on three sides. This view is the pass-through to the kitchen. Cavallos left a wide hallway with a beautiful built-in pantry and recycling center on one side, and the wall of stone on the other. There was a time when the fireplace was a humble, hardworking part of the home used for providing heat to chase out the cold, or flames to boil dinner. 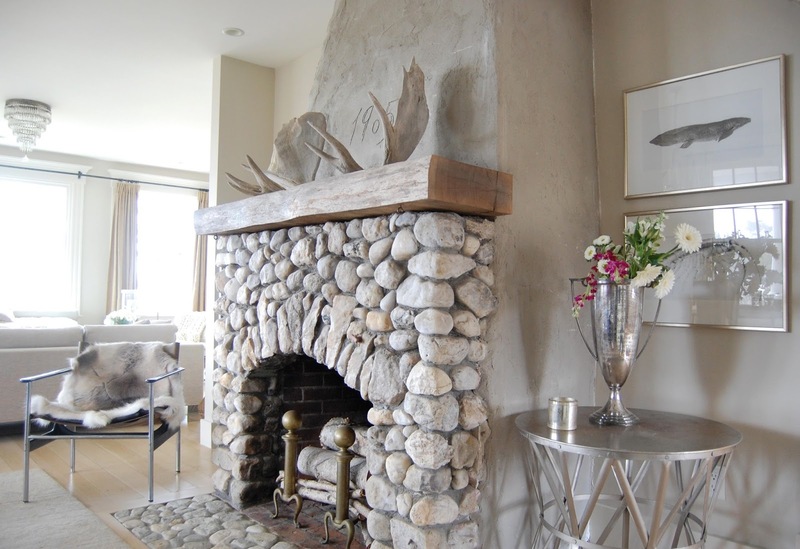 Today, the fireplace reflects the heart and soul of a room as its design focal point. Indeed, details epitomize the heart and soul of her kitchen area, as the fireplace graces the same slabs of pink granite repurposed from the original cottage as lintels - leaving the opening below to hold wood for the pizza oven, live edge white oak crafted from wood saved from the reconstruction of the ship the U.S.S. Constitution, and stone gathered by the family, all combined to bring a heartfelt and soulful cozy ambiance. "In the kitchen, the other side of the family room fireplace is our pizza oven. My son found a heart shaped stone so we used it here." You can see the heart-shaped stone to the left of the fieldstone pizza oven opening. I spotted it right off. Can you locate it? I love this idea! This heart-shaped stone is now permanently featured in their hand made fireplace, and in my mind symbolic of the love, hard work and talents of Sandra and her family -- cherished memories on display!! A fun detail is the vintage sign adorning the mantel. It's an original "Acapesket Beach" (Cape Cod) sign that Sandra found locally from her junk guy, Paul Larkin, who was recently featured on American Pickers on the History Channel (January 2nd, episode "A Rock and a Hard Place). I mean really, with connections like this, who needs a furniture store!! Another tender detail to note are the barn doors to the side of the fireplace. They were made by Sandra's brother, and lead out to their deck. The cozy library features the original 1905 fireplace which "was the only thing left standing from the old cottage." When Cavallos removed the plaster they found the inscription "1905" scratched into the mortar and, true to form, left it exposed. The library fireplace, as with each of the fireplaces, is graced with a piece of history from the leftover white oak from the reconstruction of the ship the U.S.S. Constitution. 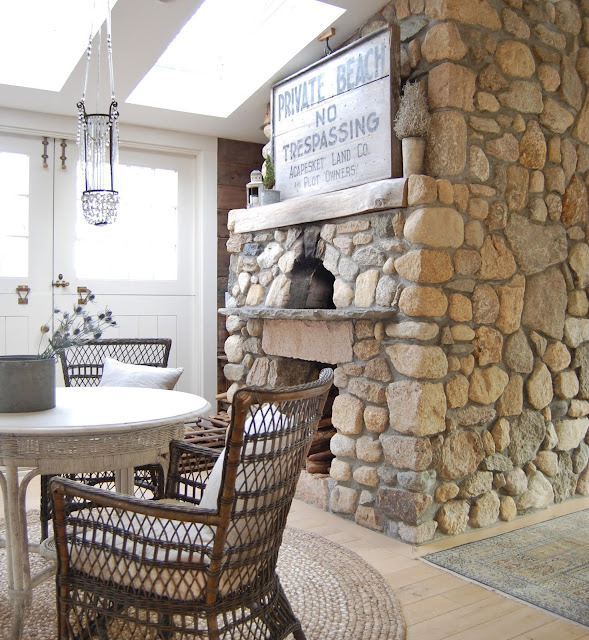 The rocks used for this fireplace were also gathered by the family from Old Silver Beach across the street. I love the way the Cavallo's home is imbued with a sense of history and meaningful collections, tastefully brought together with style and personality. It really is all in the details - thoughtful and well executed details. Sandra has a natural ability to embrace and balance contrasting styles resulting in liveliness and texture that creates a comforting and cozy ambiance. When it comes down to contrasts, we can learn a great lesson from observing Sandra's talents: mix hard with soft, square with round, blocky with leggy. 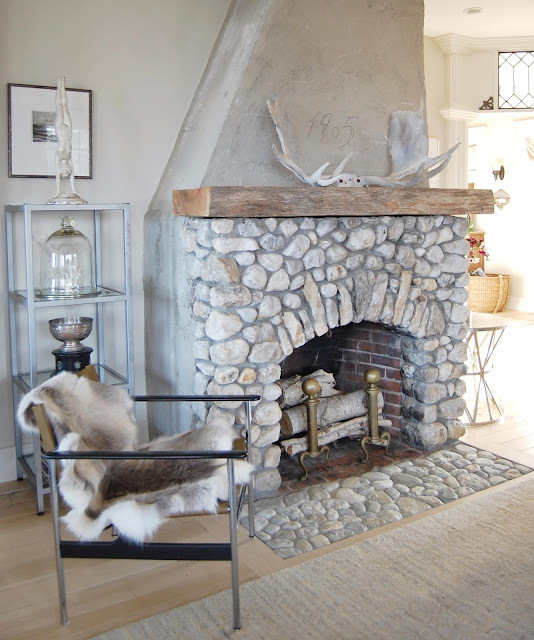 A fireplace not only serves as a design focal point, it sets an overall tone. A fireplace makes a great gathering spot and many families enjoy lounging around the fireplace to talk or watch television together. At my home, we enjoy playing a lot of games near our fireplace in wintertime. Our homes really are a personal statement of who we are and the people that live there. Another lesson we can learn from Sandra is that by incorporating bits and pieces of history, especially our own history, we make our homes personal and interesting. Think of it as aesthetically telling a story. 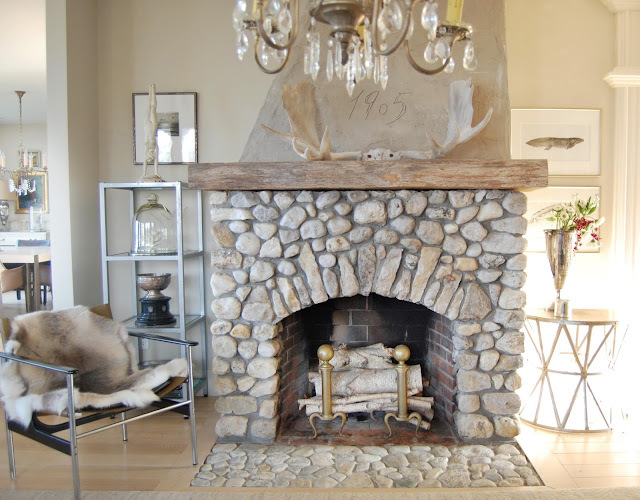 What are some ideas that you've gleaned from Sandra's inspiring fireplaces that can help you make a personal heartfelt and soulful statement in your own home? 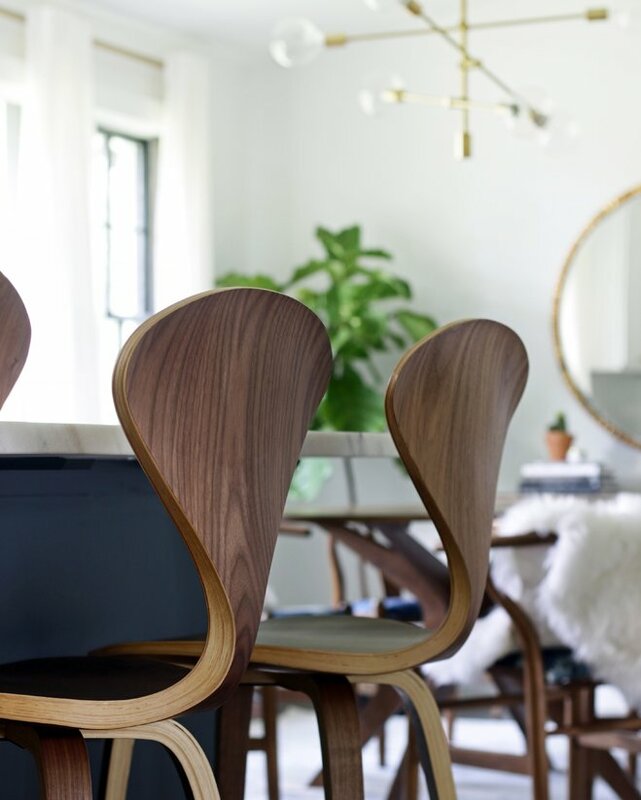 To see more of Sandra's amazing style and home, follow her on Instagram @oldsilvershed.